Dr. Hohmuth practices at the Geisinger Medical Center and is certified in Internal Medicine with a focused practice in Hospital Medicine. He lives in Lewisburg, Pennsylvania and serves on ABIM’s Hospital Medicine Exam Writing Committee. I came from a family of educators, studied anthropology in college and anticipated a career as a college professor or high school teacher. Applying to medical school was a late decision and involved taking some time off between college and medical school. At the time, I had very little understanding of what clinical medicine entailed and was contemplating an MD/PhD route with an academic focus. Ultimately, however, clinical medicine has been the most rewarding part of my career. My most memorable and cherished moments have occurred at the bedside, taking care of patients. Strive for a balanced life but remember that medicine is more of a calling than a job. Graduation from my residency training remains one of my proudest moments. I had great autonomy, a spectacular learning environment and some of the best colleagues that I have ever worked with. It usually starts with a conversation about a patient, but often winds up in a discussion focused on health policy and about barriers and opportunities to improve care delivery. I am cautiously optimistic that we are making some progress in moving away from a predominantly volume-based incentive model and toward a payment system that will reward value. Different stakeholders have different misconceptions. One thing I have noticed repeatedly is that health care administrators struggle to understand why doctors may not consistently comply with a new “ask” related to documentation. The reality is that most doctors will go far out of their way if they believe it will help their patient. Requirements imposed by payers and regulators are well intended and some have led to real quality improvement, but many impose administrative burden without a clear positive impact to the patient at hand. How would you describe your experience of joining and serving on ABIM’s Hospital Medicine Exam Writing Committee? Before I joined the committee, I knew very little about how the exams were created or how standards were set for an exam. I’ve since learned that there is a very deliberate and thoughtful process that goes into creating assessments. I’ve been able to learn new skills, meet new people from across the country and join in ABIM’s work to improve health care through certification. 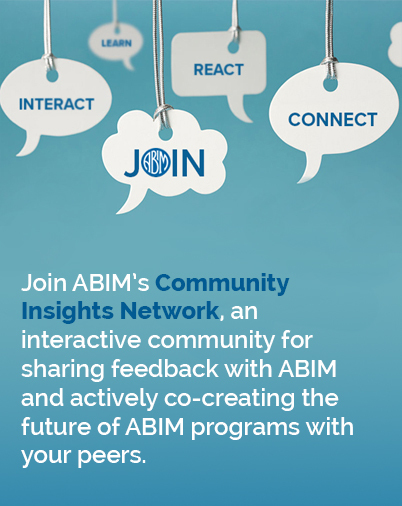 ABIM is not a group of elitists – it’s a well-meaning organization that has made deliberate attempts through standard setting committees, surveys and focus groups to understand the needs of the community. It’s been difficult to find the time to serve; however, I did so because I wanted to understand the process and influence it in a positive way. My goal was to develop exam questions that are real and practical rather than esoteric. I believe that is what we accomplish together as a committee. Our goal is to hold each other to the same high standard that ensures that certified physicians have the knowledge and skills to provide great care to our patients. I enjoy all things outdoors and anything that involves my wife and kids.